I'm sure we've all seen the salad in a mason jar thing going around the interwebs. I know I've pinned a bunch of different versions but didn't have any motivation to actually try this method of salad prep until a few weeks ago. I fell in love with a salad. 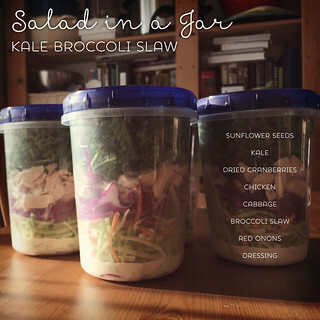 A Trader Joe's pre-packaged salad with kale, shredded broccoli, sunflower seeds, dried cranberries and chicken. I knew it sounded familiar, and there was a reason. 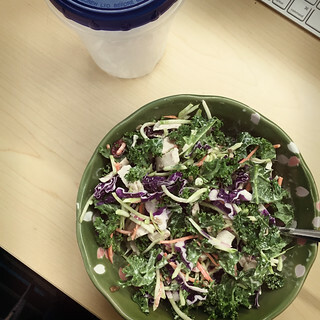 It's this Broccoli Kale Slaw that Tracy blogged about ages ago. I've become obsessed with it and wanted to recreate it for my lunches, but knew that I'd need to find a way to prep a few days worth without it going all weird in the fridge. Cue lightbulb and subsequent scouring of pinterest for all those salad in a jar pins. In Tracy's post, she uses a different dressing, but I actually like the dressing that comes with the salad, so I did a little googling and found a close approximation to that spicy/sweet dressing. I had a vague idea of how I should layer everything, but consulted some guidelines over on the kitchn to get a better idea. I bought almost everything I needed at Trader Joe's, except a head of red cabbage (though you could probably leave this out if you wanted to). I don't actually own any quart size mason jars, but I did have some quart size ziploc containers with screw on lids and they worked just fine. The kitchn mentioned separating out soft proteins (like cooked chicken), but I decided to layer it in there anyways. I wanted to see what would happen, and if I really could layer everything in there without adverse effects, I would be much more likely to use this prep method again. I did this all on a Sunday afternoon, and put the "jars" in the fridge. On Monday morning, I grabbed a jar, a fork, and a large bowl and headed to work. When lunch time rolled around, I dumped the jar of salad into the large bowl, tossed it around a bit, and ate. Same drill on Tuesday, and the salad was totally fine, just as good as Monday. Same thing with the Wednesday salad. But Thursday, we went out to lunch, so the 4th salad ended up sitting in the fridge for 5 days. I brought it to work on Friday and didn't get my hopes up. I could always buy lunch if everything in the jar had gone to mush, but I'm happy to report that it was absolutely fine. So I would say there's definitely something to this layering ingredients in a jar thing if you want to prep salads for lunch ahead of time. It was a bit of a pain to bring an extra bowl with me every day, but not so bad that I wouldn't do it again. The only ingredient that really changed at all through the week was the sunflower seeds. They were the very top layer, and they got a little soft. They didn't taste bad, they just lost some of their crunch. Not that they're super crunchy in the first place, but their texture was a bit lost once they were mixed in with everything. I might separate them out into a smaller container next time, or just add them to the jar each morning. I'm super happy this worked and that I can now prepare and eat my favorite salad for lunch during the week! \n\nI did this all on a Sunday afternoon, and put the \"jars\" in the fridge. On Monday morning, I grabbed a jar, a fork, and a large bowl and headed to work. When lunch time rolled around, I dumped the jar of salad into the large bowl, tossed it around a bit, and ate. Same drill on Tuesday, and the salad was totally fine, just as good as Monday. Same thing with the Wednesday salad. But Thursday, we went out to lunch, so the 4th salad ended up sitting in the fridge for 5 days. I brought it to work on Friday and didn't get my hopes up. I could always buy lunch if everything in the jar had gone to mush, but I'm happy to report that it was absolutely fine. \n\nSo I would say there's definitely something to this layering ingredients in a jar thing if you want to prep salads for lunch ahead of time. It was a bit of a pain to bring an extra bowl with me every day, but not so bad that I wouldn't do it again. The only ingredient that really changed at all through the week was the sunflower seeds. They were the very top layer, and they got a little soft. They didn't taste bad, they just lost some of their crunch. Not that they're super crunchy in the first place, but their texture was a bit lost once they were mixed in with everything. I might separate them out into a smaller container next time, or just add them to the jar each morning.\n\nI'm super happy this worked and that I can now prepare and eat my favorite salad for lunch during the week!